Hiking is referred to as an activity which entails walking vigorously for a long time on trails or footpaths. It is referred to as hiking when it is done in the countryside. If the same activity is carried out in an urban area, at a slower pace it is simply known as walking. Hiking is enjoyed as an outdoor recreational activity. It helps to keep the body healthy and fit by allowing the person to enjoy nature in its purest form. However, hiking requires a decent amount of knowledge which helps the individual to deal with certain situations that they may face while hiking outdoors. 1.Tent set up – Tents are usually needed when people decide to go for overnight hiking trips. However, it is better to carry the equipments because hiking may lead people from one path to another and the weather is not always reliable. There may be a need to stop at a particular location. Hence, it is beneficial to learn how to set up a tent. Tents can be made in different shapes such as blue bell, body bag, basic fly poles roof, dining fly, etc. as the location may permit. 2.Location for the tent – The tent must preferably be set up in places where wind flows in the direction of the entrance of the tent. This is done to prevent mosquitoes from bothering the hikers. Also, it is best to set up tents in places that are marked safe from wandering wild animals. 3.Convenient back packing – People should bear in mind that they have to carry their back packs on themselves along the entire journey. Hence, they should pack intelligently, in order to do away with things that are not required while packing those that are important. Things should be packed so that their weight does not burden the person, at the same time it should provide for the needs of the individual during the trip. Folding intelligently and compartmentalizing the luggage is helpful for making space. 4.Trail marking – It is a well known fact that hiking is usually done in places that are comparatively less populated or in the country side. While hiking people may wander far away. Hence, it is advisable for people to mark the trail they are following while hiking. This will help them to find their way back and prevent them from getting lost on the trip. Trail marking can be done with the use of bio degradable tape to prevent hazards caused to animals. 5.Water proofing – Hiking is an outdoor recreational sport. It may or may not last for a couple of days. Hence, there is always a possibility of changes in weather. Sudden spells of rain or even a need to cross a water body such as a stream may occur during the trip. To avoid any set back due to these conditions, it is better to keep the back pack water proof and wear a layer of water proof clothing too. 6.Learn to estimate daylight – It is important to learn how to estimate daylight while going on a hiking trip. This is done to know how much time is left for sunset, as most people prefer to move along their trail before sunset as it is safer. The estimate is made by measuring the distance between the sun and the horizon by the hand. The each finger equals to approximately 15 minutes of daylight. Knowing how to estimate daylight helps to steer clear of mishaps and prevent encounters with wild life. 7.Save space – A hiking trip necessarily means that the person has to carry his/her baggage on them while hiking. There is limited space to accommodate all the items of necessity that are required during the trip. Fitting certain items into each other is a way of saving space, for example packing duct tape around bottles or lighters. 8.Clothing – It is advisable to wear three layers of clothing in order to be prepared for any kind of weather conditions. The first layer is used as base, then the insulation, heating and lastly, water proofing. The clothing must be comfortable and allow the person to move around freely and enjoy the hiking trip. 9.Preferable materials – While choosing clothes for the hiking trip people must avoid materials such as cotton, as they do not dry up moisture fast. Instead materials that do not absorb moisture easily must be used. Hiking may cause a lot of sweating due to the physical exertion of the body for a considerable period of time. 10.Food – Tinned and canned food are preferred for hiking trips as they are convenient and do not require much preparation. However, these food products may be comparatively expensive. Thus, people may opt to make simpler food items that are easy to make and carry such as sandwiches. 11.Drinks – Due to the extreme physical exertion that the body performs, it may get dehydrated easily. Hence, it is important to carry fluids to keep the body hydrated at all times. Not just water but certain fruit juices and energy drinks can also be carried as drinks for hiking trips, they also help to increase sugar levels or glucose in the body. 12.Carry a first aid kit – It is always advisable to carry a first aid kit while going on a hiking trip. This is done to take care of accidents or cuts that may occur during the trip. The first aid kit must include band aids, anti septic creams and solutions, etc. to tend to bruises and cuts. Medicines that people use for conditions that occur frequently must also be carried during the trip as they may be needed at any time. 13.How to handle blisters – Walking vigorously for a long time causes sweating and may result in blisters. Hiking socks are worn to prevent the formation of blisters. Duct tape may also be used to cover blisters and to reduce the pain caused due to them while hiking. To avoid blisters people must make sure that their clothes and shoes have some sort of ventilation to prevent the excessive sweating without giving time for air to absorb the moisture. 15.Starting a fire – It is important to carry equipment to start a fire while going hiking. People must carry cotton dipped in wax or coated in Vaseline, which helps to start a fire easily. Starting a fire is a good option to keep wild animals away and to help with the cooking and travelling. Finding firewood in an unknown location is not an easy option. Thus, it is better to be prepared with equipments that will help to start a fire. 16.Carrying portable utensils – Over night hiking trips or trips that last for a few days require the person to carry some utensils for the trip. Even though, very few utensils are carried during the trip to reduce the weight of the baggage, it is better to carry multipurpose utensils that are portable and easy to carry. For example, using a set of fork and spoon bound with tape or elastic, and a single bowl for cooking and eating. 17.Walking staff – Hiking may require people to travel along a trail that is long and may include paths that uphill. Using a walking staff provides support and stability during the long and vigorous walk. It prevents chances of back and leg ache by providing balance to the individual. It is considered good for the knee as well. A walking staff is not a necessity but it definitely helps to ease the journey. 18.Waterproofing match sticks – The resin secreted by female lac bugs is known as shellac. These are mainly found in India and Thailand. Shellac is used as a tinned product that is used for water proofing. It is advisable for people to waterproof their matchsticks by dipping them in shellac. This is done to prevent them from dampening, which would prevent them from lighting a fire. During hiking trip people may experience rain, coating them with shellac is hence thought to be reliable. 19. 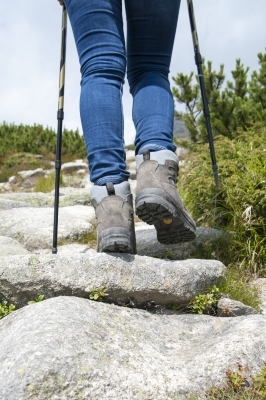 Care for sensitive devices – Hiking trips can lead individuals to face difficult weather conditions or situations that may require them to get drenched in water. Carrying sensitive items such as mobile phones is risky as they are sensitive to moisture. To protect them from any possible damage, individuals are advised to pack them separately in plastic bags, so that they remain unaffected by such situations. 20.Knowing how to make knots – Knowing how to make knots using the correct technique is important. Knots are required for setting up tents and to make markings along the trail. Hikers can use manuals and watch tutorials available online to learn the correct technique. This may seem trivial but while a person is on a hiking trip even the most ordinary things seem to be of use in one way or another. 21.Knowledge about insects – Just as plants, there are a large variety of insects too, that are found in forest areas. These insects may belong to different species and may either be harmless or fatally poisonous. It is important to have some basic knowledge about the variety of insects that an individual may come across during their hiking trip. A little research about how to identify various kinds of insects and to know whether they are injurious or not goes a long way in keeping accidents at arm’s length. 22. Keep ticks and termites away – There are certain repellents, ointments and equipments that help to keep ticks away. Ticks are a certain kind of parasites that resemble little spiders. They may be very different in their appearance. However, they all primarily feed on the blood of birds, mammals, animals and human beings. 23.Safety – Safety is of utmost importance in a hiking trio because it may lead a person to tread upon a path that is unknown to them. It is recommended that people should inform someone about their plans and give an approximate idea about the location where they are going hiking. Also, it is preferable that people stay away from core areas that have been marked as regions where animals are prone to wander. 24.Wild animals – It is best to steer clear of areas where people may encounter animals, such as near streams where they may come to drink water or in densely forested areas. People should also carry tranquilizers or bear sprays, just so that they may be ready to tackle an encounter with animals. Animals are usually lured in by the smell of the food that people carry with themselves. Hence, it is best to store the food in air right containers and keep them away from where they are camping, preferably at a certain height. 25.Set out early – Hiking is an activity that requires an individual to set out on a trip, whatever the duration may be, into unknown territory. Trails may lead the person from one location to another. Hence, it is always better to set out on a hiking trip early. This is done to avoid the scorching heat of the sun at day time that may tire the person easily and to allow the person to travel while the daylight is still available to avoid getting lost. It is another precautionary measure used to minimize the risks and maximize the fun involved in hiking trips.